Born and raised in show business, little Frances Gumm changed her name to Judy Garland and became one of classic Hollywood's most popular musical entertainers and actresses. She won her only Academy Award in 1939 "for her outstanding performance as a screen juvenile during the past year," most notably for her work on "The Wizard of Oz" Later in her career however, she would earn greater recognition for her acting abilities with Oscar nominations for her performances in A STAR IS BORN (1954) and JUDGMENT AT NUREMBERG (1961). Judy is my favorite female classic movie vocalist, and in 2004, the American Film Institute's ranked five of her famous film numbers among its list of the 100 Greatest Movie Songs -- more than any other female vocalist. Judy Garland's performance as Dorothy in The Wizard of Oz (1939) won her a special Oscar and gave her a theme song for the rest of her life: "Somewhere Over the Rainbow." "That Old Man River keeps rolling along" was one of the many songs that Judy Garland recorded. She was born in 1922 in the Upper Mississippi River town of Grand Rapids, Minnesota, where the Judy Garland Museum takes up an entire floor of the old grade school. A block away is the site of the home where Garland spent the first five years of her life. That spot is now occupied by a multiplex cinema in the town's only shopping center. Garland's father operated the only movie theater in Grand Rapids until he moved the family to California in 1927. Garland made her stage debut at that Grand Rapids theater with her two older sisters. In 1934 the Gumm Sisters performed in Chicago during the World's Fair there. That is where Frances Gumm was advised to change her name to Judy Garland. Her voice got her into film acting when she was 13 and kept her in demand for stage and television performances after her film career was over. 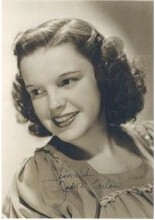 The Judy Garland in the later movies was much slimmer than the teenager who co-starred with Mickey Rooney and who played Dorothy in "The Wizard of Oz". The final display in The Judy Garland Museum blames the pills she started taking in the 1940s to achieve the streamlined figure Hollywood wanted her to have for her early death at the age of 47. Judy Garland Autographed Signed Photo STUNNING! This is the seventh item I have purchased from Kevin and once again I am very satisfied.Highly recommend.